Are you facing many spam articles and spam users registered your site and causing trouble in your WordPress blog? Don’t know how to get rid off this problem? Don’t worry there is a FREE WordPress Plugin called WangGaurd which protects your registration pages from unwanted users. WangGaurd is the most advanced protection against sploggers and spam users registration, is fully WordPress,WordPress MU ,BuddyPress and bbPress 2.0 compatible. A spam blog, sometimes referred to by the neologism splog, is a blog which the author uses to promote affiliated websites, to increase the search engine rankings of associated sites or to simply sell links/ads. 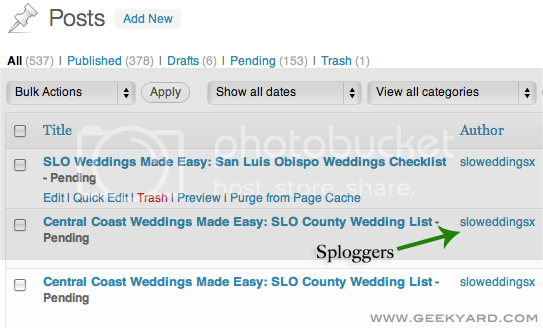 The above screenshot clearly shows Sploggers and the spam post they submitted for review in Geekyard. WangGuard cleans your database from sploggers, spam users and unwanted users. Is very dangerous to have sploggers, spam users or unwanted users, they could hack the site. The sploggers, spam users or unwanted users uses your server resources for their benefit. They can overload your site to their benefit hurting you and your users. They hurt your position in search engines like Google. Search engines such as Google can block your site because you are advertising illegal, prohibited or dangerous products or content. Sploggers, spam users and unwanted users, bothers the rest of your users, this may cause them to sign off your site. Do not bother your new users with complicated captchas that in most cases do not stop the sploggers, spam users or unwanted users. WangGuard fixes all of these problems, and if you’re a personal user, it does it for free. How to Install WangGaurd in WordPress Blog? Just Install and activate the WangGaurd Plugin. Once the installation is over. 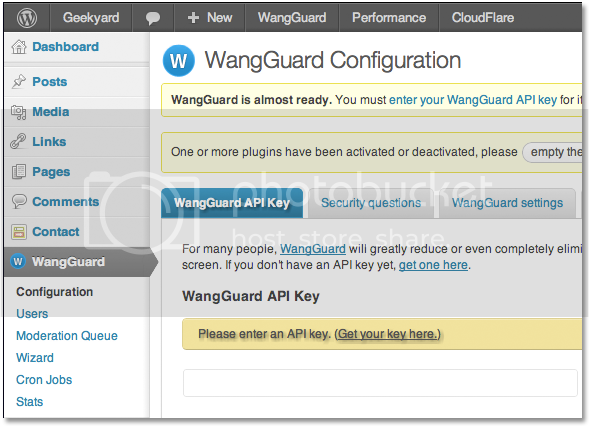 Navigate to WordPress Dashboard –> WangGaurd. Now you need to register and enter a API key for it to work. Click get one API key to register and get a API key. Enter the API key and click update options.